September 9th to 11th of 2016 in the water. The ALGEMAC II will be in the water at slip B24 for all to board, take notes, pictures and have questions answered. Why aren't solar boats more popular? No demand = no change. FC - Fuel Cell (produces) electricity from gases or fluids without combustion. Various types. PV - Photovoltaic cells arranged to (produce) electricity (a module) from sunlight. Various types. Back to 'no demand = no change'. The argument goes, how can potential consumers demand something about which they know not? Correct but that is the job of the boat manufacturer (in this case) involving the marketing team. The reason for no marketing is that the company wants to market what will sell. A company does not make money producing a product (major costs) by educating the vast potential prospects (major costs) only to have a competitor come in later in the education process and scoop up the converted consumers. Yes, it is money and consumer's money at that. Without a market, there is no way for a company to sell a product, to reap a profit, that can be plowed back into improving the product offered. Especially when the product is sold as a discretionary item, absolutely not required by the user ( a yacht). 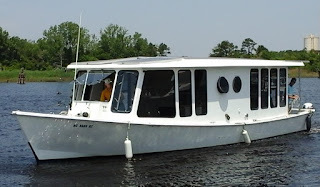 In order to successfully 'bootstrap' a company that offers a self fueling, low maintenance and easily handled boat, demands that the boat be of competitive initial price and lack none of the amenities of a currently fossil fueled boat of same size. That will not happen for at least years and maybe decades. It is up to you to read this whole article and understand it (post questions if unclear). As a member of the prospective boat purchase 'interested' market, that is your responsibility. If my advice is somehow found to be askew, it is still your due diligence that will overcome my shortcomings and lead to a more informed you. OK, my part and yours are loosely defined and a team is now formed to ferret out what to really expect. Let me offer the ultimate self fueled boat that is technically produceable right now, as a start point, skipping over the EV, PEV, HEV and FC oriented craft. Go for broke here... TEPS (Totally Electric Powered Solar)tm boat. In essence, when you buy the boat, the fuel (solar modules atop) comes with it for the next twenty or so years. Think on that a minute (no fuel, filters, oil, injectors, centrifuges, oil filters, oil changes, disposal, fines, valve settings, noise, vibration, smells, engine logs, fuel stops)... you can add more. How do I get this magic boat today? 3 examples follow. 1. Requirement number one is reduce. Literally give up stuff. Size matters! When was the last time you delved into the back of the big fridge on the boat? A 3.5 cubic foot will do with todays packaged and frozen foods. 2. Get to meet folks that have a fifty foot yacht, have money to spare and they now cook on an $80 induction unit the size of a hot plate. Why? Because it is not only instant heat but puts out less ambient heat, requires less time to cook, less electricity (uses the house battery rather than the gen set), cleans & stores easily. 3. Air conditioning is great but the limited effect of a sea water intercooler, the water circulation pumps and additional through hulls are expensive to buy, fit and maintain compared to a window type AC unit or the newer modular (split) units. If one does not like the look of a window unit, talented ship carpenters can creatively hide the perceived beast. The AC option then costs less, functions in or out of water, is replaceable from Walmart and much more portable, should the need to move it arise. The TEPStm boat really becomes a floating, mobile, power source that represents your personal involvement in due diligence, creativity, customization, responsibility, stewardship and fiducial cleverness. Is there such a boat on the market? Some are getting close to pure solar but putting the boat up on plane or even maintaining 7 miles per hour for a half day is not in reach without dropping $30k to $50K in exotic batteries. 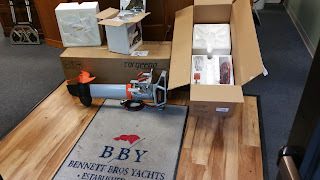 Almost one year ago (2016) 20hp motors that could be used inside or outside the boat with ninety percent efficiency, came to the American market. Until then, on the MOG, ALGEMAC II, our 92% efficient motors were custom made and prohibitively expensive for a consumer. That impediment is now lifted with the advent of new outboards that are incredibly small and hugely powerful. These new motor/boat combinations are a direct analogue to the non-engined pure sail boat, power from nature. Some of the manufactures at which MOG has been looking and in contact are Elco, Torqeedo, Parsun, Golden, Cree, Navy 6, RiPower and Aquawatt. We plan to show one of these manufacturers models at the show. That will depend mostly on our findings, their specifications, answers to our questions and mostly, do the models fit our need. 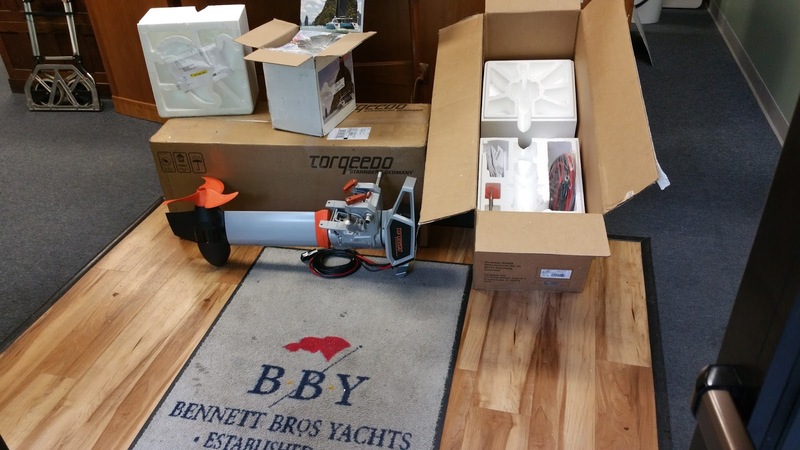 UPDATE TODAY September 1.... Two Torqeedo 4.0 Cruise electric outboards will be displayed on the stern of the MOG Totally Electric Powered Solar (TEPS)tm boat. We are very excited to be able to show their new advanced motor and will have brochures for those with interest in becoming acquainted with their improved technology. The MOG is a prototype and not for sale, a private endeavor and technology demonstrator. At the show you can observe from a monetarily safe distance the nearly 30 year project. Until some company wants to plumb the depths of the TEPStm market, the ALGEMAC II will maintain her lead and carry your best hopes and wishes. See you at the show in Wilmington, North Carolina.